Writer for hire. Reviews, essays, features. Railways, like Romans, prefer to take the direct route. Tom Jeffreys, trekking on foot from London to Birmingham along the putative course of the HS2 high-speed line, is more of a rambler. Of course, his direction always tends north-north-west, but Signal Failure is a book about the verge and the siding, the hinterland, the brownfield, the landscape that makes way, and the noise that crowds the signal. 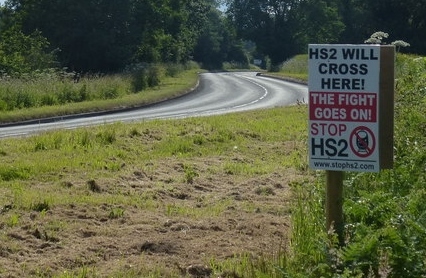 The idea is to compile a state-of-the-nation snapshot from conversations about the new line, with landowners, farmers, protestors, planners – those whose life or livelihood falls within the HS2 pale. It’s a brave mission statement from a man who is “not a natural conversation-starter” (one of a few points in the book where you have to ask Why in hell are you doing this? ), but Jeffreys makes an affable interviewer. Do we learn a great deal about the state of the nation from whether or not Roger and Jenny want a railway embankment running through their village? That’s harder to say. We’re told that “across the UK, people are tired of being forgotten, of being left off the maps produced in London to be perused in London for decisions made in London”. Well, that’s transport infrastructure for you – it often seems to pit the Little People against the Machine. Frank Norris used a railroad to embody what he called “the octopus” in his 1901 novel of that name; the agriculturist William Cobbett called it “the Thing” – the unstoppable mill of capitalism. This is a book in the see-it-for-myself tradition: Jeffreys declares that “direct experience is the best teacher”. There’s a good deal of agonising over what other traditions the text might fall into – travel? nature? landscape? sociology? – and this is a richly read book, so I was surprised to find no mention of Cobbett’s Rural Rides (1822-26), another fact-finding ramble across the southern and midland English counties. Jeffreys shares Cobbett’s galvanising curiosity and irresistible urge to digress, and the two are also alike in fallibility: Jeffreys’s occasional gaucheness, oddly enough, is the making of this book. There’s nothing in Signal Failure as funny as Cobbett’s tragicomic inability to avoid crossing the Hindhead in Hampshire (it’s the way he tells it), but Jeffreys’s attempt at wild camping in the Ealing suburb of Perivale comes close – it’s not so much the slapstick of the wonky tent that gets you as the mounting panic of the would-be wanderer watching his comfort zone disappear over the horizon. Like many other young men who write about landscape and nature, Jeffreys is often terribly earnest, but he is also honest. He addresses his own shortcomings more or less cheerfully, which presents a refreshing contrast to the offhand omniscience of the textbook lone enraptured male (even if, at times, naivety shades into sloppy fact-checking: Gilbert White, who died in 1793, is described as a “nineteenth-century naturalist” and associated with “lush prose”). Jeffreys doesn’t hesitate to tackle the wider socio-economic themes that he considers central to the HS2 project. He is passionate and well-informed about urban development and gentrification (though his aesthetic – scruffy good, clean bad; molehills good, lawns bad – sometimes feels a bit shop-bought). When he plunges off the path, the results can be mixed (we learn a lot more about the development of Amersham than might be thought necessary), but he is often winningly self-aware: there’s a wonderful passage about the nature writers who move to London and end up “reading fox-tracks and graffiti tags and calling it psychogeography”. Will Signal Failure change anyone’s mind on HS2? The drift here is generally anti – the rail line framed as a corporatist adventure – but this isn’t a book that gives us easy answers. What it gives us instead is context and texture; human lives, human communities, living landscapes, on-going social histories. Through it all, Jeffreys’s writing is intelligent, engaging and engaged, and deeply and disarmingly human. Previous BBC Wildlife feature: Happy Planet?